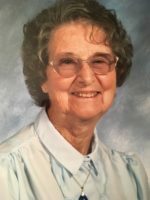 Ileta Lucille (Myers) Lober- Marsh passed away peacefully in her sleep, Monday, April 8, 2019 at Life Care Center in Plainwell. She was born January 22, 1926 in Hastings Hill, West Virginia, the daughter of George and Bonnie (Horner) Myers. Ileta grew up in Hastings Hill, Pine Grove and New Martinsville, West Virginia with her four sisters, Anita, Ethel, Leanore and Leah. She married Floyd W. Lober who passed away in 1969. She resided in Martin, at the Lober’s dairy farm, Otsego, MI, then Pine Lake and then back to Otsego. On June 26, 1971 she married Leroy Marsh who passed away in 2002. Ileta had worked at Otsego High School and at a nursing home in Plainwell. She was very active with the Otsego VFW Ladies Auxiliary for over 50 years and held all of the officer posts. She enjoyed being involved with TOPS for over 30 years and was a 4-H leader. Surviving are her children, Shirley (Charles) Lober-Rumpf, Floyd “Randy” (Mary) Lober and Leslie Lober; grandchildren, Scott and Michelle Fris and Wilhelm, Georg (Kelley) and Sigmund Rumpf and great-grandchildren, Ruth Ann Fris and Merinna and Marcus Keller. She was preceded in death by her parents, husbands and daughter, Sandra Fris. A family service will take place. Burial will follow at Hillside Cemetery in Plainwell. Contributions in memory of Ileta may be made to Wings of Hope Hospice of Allegan. We are very sad that your mom has passed away. Always remember your memories and keep them close in your heart. A mother’s love can never be forgotten! Please know that your mom is now a special Angel in Heaven watching over you! Sorry for your lose. I know that she is with the lord now. Randy and Mary sorry to hear of your loss. From the information in the obituary it sounds like your mother was an outstandings person. Our thoughts are with you. Randy your mother raised a fine son. So very sorry for your loss.. Ileta was always such a positive lady. May your memories be of comfort to the Family now. I met ILeta at the TOPS 1007 group in Otsego. I am happy I shared some time with such a sweet lady. She will be missed. I am so sorry you have lost your mother. There is no one like our moms! You are in our prayers! How do I send condolences?